Our team really enjoyed the recent shooting competition show “Night of the Saint” produced by Springfield Armory. While the show was focused primarily on the use of the Springfield Saint AR-15 we thought we would focus a giveaway this month on something a little more appropriate for daily concealed carry… the XD Mod.2. Help us congratulate Katelyn, the recently announced winner of the competition; and enter to win your very own Springfield XD Mod.2 9mm handgun. INSTRUCTIONS: To enter, first login via Facebook or by using your email address. Then agree to enter the giveaway mailing list. Then, optionally share this giveaway with your friends via social media for additional entries into the giveaway. I have a XD-S 45 Springfield,and just love it!!! One for each hand !! I’m already a subscriber. Please enter me in the giveaway. Thank you. Can’t go wrong with a Springfield! I like it almost purchased one at the store. Free one would be better. If I win one,it will save me bbuying one. I think I would rather have this in 45 CAL, but beggars can’t be choosy. A Springfield 45 ACP is a good way to go. Would like to win anything. I’m a Springfield man all the way. They are made for me. I already have this gun, but hey, who can have to many guns! And to the other ladies on here it fits the hand really nice. I love mine. I would really enjoy winning this 9mm Springfield. I have just received a holster designed for carrying around my midriff. This 9mm would fit it perfectly. Great firepower in a holster that can be worn all the time. Wonderful marriage. Would love to have a good quality gun. This weapon seems so convenient to carry. I’m also a senior citizen. Safe neighborhood, but have too go a lot. Have physical problems and a disabled wife..
Bought one for my wife, a free one would be nice for my girlfriend. Would really looove tooo win this gun! Great little shooter , easy to carry , 13 or 16 + 1. Hope Greg’s wife doesn’t read this. Would like this handgun, please enter my name. Thanks. I could really use it. I am taking the class next month and would love to surprise my husband with winning this (if I do). Please enter me to win this gun. Love my Springfield! Would love a second one even more. I want it now . I love my Springfield XD_9,and any orther Springfield would be awesome! This would be the perfect gift for my wife! Love, Love , Love Springfield’s! I don’t own a handgun. I have taken the class and am ready to get my permit. Like Springfield’s . Great Handgun’s. I have a full size xdm 45 I absolutely love. This would be a great backup. I was able to shot my grandsons Springfield today. It feels much better then my ruler. Plus my shoot group was better grouped, I went though about 150 rounds, and it felt better. This would be nice to have, I would be grateful if I won! PAST PRESIDENT OF OJAI VALLEY GUN CLUB, UP AGAINST A GOVERNOR THAT HAS LOST ALL RESPECT FOR THE SECOND AMENDMENT TO THE PEOPLE HE IS SUPPOSED TO SERVE WOULD RETURN TO THE RANGE ABOVE OJAI , CALIFORNIA WHERE I HAVE SERVED SINCE 1968 . EDWARD HAVERLY. I have been looking at the weapon for a month or so only in the 45. Fantastic give away, always a fine firearm the Springfield is one of the finest. I do transfers for a lot of my friends and the Springfield is a very popular firearm. I would love to have one of these. But one would not expect less from Concealed Carry, thanks for a chance to win a this fine firearm. Hope you’re not crooks like Gunwinner.com who deleted 2 months worth of entries for me for no ——- reason! I have two Springfields they’re the best shooting guns that I have. They are easy to take apart and clean. I just got my concealed, and I’ve actually been looking at one of these, I love the way it feels, its balanced nicely and its just a beautiful design. I would love to win one. Please please. 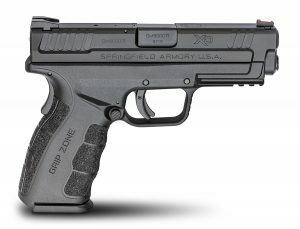 Would like to win this Springfield XD 9mm. would really love to win this pistol.